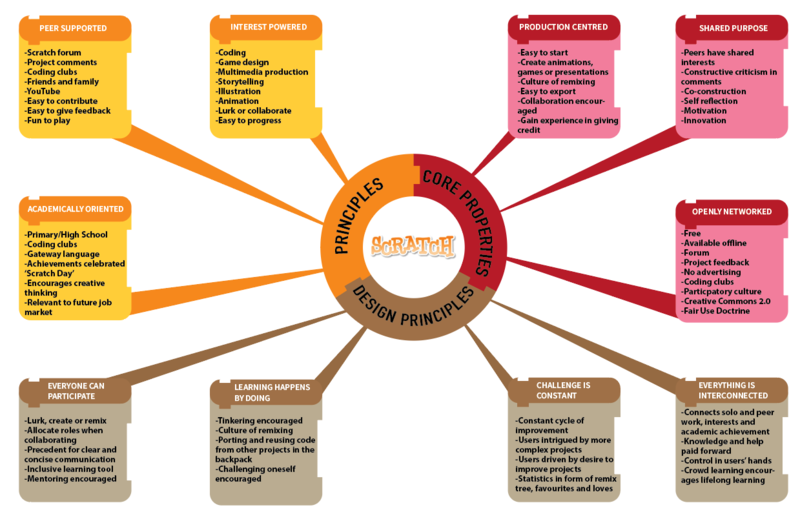 Scratch mapped to the connected learning principles, core properties and design principles described by Ito, Gutiérrez, Livingstone, Penuel, Rhodes, Salen, Schor, Sefton-Green, and Watkins (2013). Click for a larger version. Above is a map of Scratch. It’s a connected learning environment, a website for coding and sharing games, animations and stories. Scratch was developed at the Massachusetts Institute of Technology (MIT) by the Media Lab’s Lifelong Kindergarten research group. Developed in 2002 and launched publicly in 2007, it updated to Scratch 2.0 in 2013. Users move and join code blocks to create their program. Seeing the commands contained in the blocks helps users to learn fundamental coding terminology. According to Ito, Gutiérrez, Livingstone, Penuel, Rhodes, Salen, Schor, Sefton-Green, and Watkins (2013), connected learning happens where peer culture, academic subjects and interests meet. For many young people, these ‘spheres of learning’ are not normally connected in the conventional school system. Connected learning involves a deliberate attempt to connect these spheres in order to create new opportunities for learning. Networked media and learning tools provided via Web 2.0 technology can increase the number of these entry points. In the past, if you wanted to learn how to code (assuming your school didn’t teach it), you had to find friends or family to teach you, take an extra-curricular course or get books from the library. Now, you can find a peer-supported community. Jenkins (2009) states that participatory culture has grown in the 21st Century. Jenkins, Ito and Boyd (2015), describe participatory culture as a diverse and democratic society where people make individual and group decisions and express themselves in many ways. According to Fields, Vasudevan and Kafai (2015), Scratch is extremely social and its fun (and often irreverent) nature encourages play. Users contribute ideas, expertise and questions. Projects and feedback can be shared at a button’s click. Peer support and feedback on the Scratch website can be seen in the forums, collaboration spaces, project comments and user-created tutorials. Dron and Anderson (2014, p. 300) believe this ‘on demand’ availability is integral to connected learning, enabling scratchers (Scratch users) to search for assistance whenever they have knowledge gaps. Jones (2015) states networked learning’s peer aspect makes it superior to passive online learning. Away from the site, peer support can be found via YouTube channels, friends, libraries, museums and coding clubs at school. Scratch’s integrated social media function is so impressive, users don’t really need to use other sites such as Facebook or Twitter to connect. Social media on those sites tends to be more useful for educators and parents. Scratch also has its own dedicated peer-sharing platform for educators, ScratchEd. It provides resources such as face-to-face training, online workshops and a curriculum guide (Harvard Education, 2014). Sometimes disagreements occur on Scratch about ethical behaviour. Roque, Dasgupta and Costanza-Chock (2016) say when users disagree about project suitability, e.g. graphic images, the moderators present a calm and fair demeanour and the virtual community comes to a joint decision. One potential risk is online bullying. Content sharers often believe their audience is sympathetic (Brake, 2014). In the future, teaching commenting etiquette in tutorials and classrooms might be beneficial. Some teachers have had success with physical ‘blog walls’ to monitor how children interact before allowing them online (Holland, 2013). According to O’Donnell-Allen (2014), in a classroom, it’s imperative to remember collaboration doesn’t just happen automatically. This is because students have disparate interests. Scratch, however, has an advantage: it is interest- powered. Interest-powered can refer to anything we are interested in doing such as hobbies, creative arts, professional development or fitness. Ito et al. (2013) state most people like to spend their free time doing things they are interested in. Mirra (2014) believes interest-driven learning is a right and crucial for expressing interests and skills. With Scratch, the interest is coding and multimedia creation. Scratchers can choose to lurk or collaborate. Expertise development is supported by groups, the online tutorials and guide and peers. Although achievements are celebrated, Resnick and Robinson (2017) argue intrinsic motivation is key to developing creative, lifelong learners. They require autonomy and options to maintain their enthusiasm. That’s why Scratch users can create inspired projects beyond games like animations and stories, making projects interesting for many people. Future education needs to tap into learners’ interests. Mirra (2014) argues we shouldn’t underestimate children. We should listen to them and help them to become autonomous in voicing interests, beliefs and ideas. Scratch is fulfilling this role wonderfully. Being academically oriented enables a pastime to become more than a hobby. It can lead to formal academic qualifications and even a future job. It’s the seed mastery can grow from, supported by interest while it’s developing. Scratch is a gateway language to other forms of coding. It’s often used in schools in Australia, both in lessons and extra-curricular coding clubs. Mentors can also be connected to through the forum. According to Shin and Park (2014), Scratch improves cross-curricular skills such as problem-solving, planning and decision making. Not only is this beneficial at school but also in students’ personal lives outside of coding. Falloon (2016) says using Scratch can help students learn about other curriculum areas such as shapes in mathematics. Ito et al. (2013) argue it is important to celebrate achievements. Scratch-based examples include Scratch Day and open sessions for parents to come into school and see what their children have created. We need to find ways to connect students’ interests with future-proofed skills. Garcia (2014) states that even though the concept of being academically-oriented should be familiar to teachers, educators need to find out what is important to students and combine those interests with academic goals. However, Garcia states schools are operating under a misapprehension about what students need academically because future job markets will look very different, a fact agreed upon by Ito et al. (2013). Resnick (2017) believes encouraging students to become creative thinkers is a key academic responsibility for the future. Scratch is all about creating projects with its digital production tools. Remixing and giving feedback on other remixes is well-supported. Scratchers are encouraged to become familiar with giving credit when remixing. It is extremely easy to discover work on the site thanks to the search function. It is also easy to export projects, save videos and embed projects on blogs and websites. Benkler (2017) states remixing is important for innovation and Scratch encourages this. Resnick and Robinson (2017) support this, noting remixing has been integral to Scratch’s production-centred nature, helping to radiate ideas through the learning environment. According to Lee (2014), it’s not enough to produce just anything, it needs to have meaning to an individual and an audience. Simply put, it should be something good. To be good means it resonates with us. It’s our voice, ideals and values that have influenced its creation. It’s important to us. In this way, production-centred links with interest-powered. But how do we know if it’s good? Not only do we know intrinsically, people with a shared purpose tell us. While Scratchers can work as individuals, group collaboration, sometimes called a ‘company’, is encouraged. Competitions such as the Scratch Cup and Scratch Olympics are held. Scratchers can become helpers by designing a welcoming project, while curators monitor which projects get displayed on the front page. This helps scratchers to lead as well as distribute authority across diverse age groups. Scratchers are encouraged to always strive for the next milestone. Tierney, Corwin, Fullerton and Ragusa (2014) argue educators need to teach students how to collaborate to complete goals together and how to value the different skills brought to the table by individuals. This shared purpose and co-construction can lead to motivation and innovation. Filipiak (2014) adds educators need to listen carefully to young people to find out what they care about when deciding what and how to teach them. This could make education relevant to all, not just a few. Students often disconnect from education because they feel the system demeans their identity or lifestyles. Shared purpose, however, encourages people to connect and carry out self-reflection. Scratch aids this growth process because the community is united in its shared purpose of content creation, while smaller sub-sections of the community create niche content that’s important to them. Scratch is free, meaning that if a child has a computer and Internet access, they can use it. Additionally, there is no advertising, meaning that Scratch does not have excessive corporate ties or allegiances. Being openly networked allows as many children as possible to use the site. Scratch doesn’t currently work on tablets and some mobile devices although this functionality is planned for Scratch 3.0, which is due for release in August 2018. There are numerous entry points for children to find out about Scratch, for example, coding clubs at school, the Coding Kids website (which details extra-curricular clubs), introductions by friends, playground talk or YouTube. As projects are saved in the cloud, users can resume previous projects on a different device elsewhere. Jenkins, Ito and Boyd (2015) state using Web 2.0 technology doesn’t automatically create a participatory culture because copyright issues have regularly stifled creativity and participation. Scratch aligns with Creative Commons licence 2.0, meaning users are allowed to remix at will. Under the fair use doctrine, scratchers can use copyrighted images and audio in their projects as the site is for educational purposes, but Scratch degrades any images or videos so the site isn’t sharing high-quality copyright material. Users are, however, expected to give attribution to the original creators. There are not many examples of forced takedowns. A Pac Man clone was removed by request, but other versions have been left up, and the game has been remixed regularly. Networking is easy in Scratch and accessed through the forum, where scratchers can find a project they like and coordinate resources. Scratchers then discuss the project and allocate roles. Here’s an example discussion about a game with magical characters. While there has been some discussion about having badges and achievements, most of the community agrees that adding competitive elements is not in line with the learning focus of the site. According to Hunt (2014), being openly networked makes work visible to others, allowing teachers to be students and students to be teachers. It is a great democratiser! In my opinion, opening up what you do for others to see can only increase your opportunities. When collaborating via the forum, users assign each other roles, as shown in this example, and discuss plot when there is a storyline. Scratchers might act as artists, dialogue writers or mentors. On the forum, communication is usually clear, confident and efficient. Barriers to entry are low with simple beginner tutorials that increase in difficulty as knowledge requirements grow. So, no matter what their level, everyone can participate in a group or solo project. Scratch has been and will continue to be an inclusive learning tool. Brennan (2013, August 23) argues all children should learn how to code as it is an essential modern-life skill. Lin and Chang (2015) state Scratch’s flexible interface may be useful for designing activities for children with physical special needs in a way designing for traditional games consoles does not. Aside from the barrier to entry created by not having a computer or internet access, attitudinal barriers also exist. Maggio, Saltarelli and Stranack (2016) state some students don’t want to explore personalised connected learning, citing reasons such as time constraints. The role of the mentors and strong role-models is important if educators are to encourage children to take advantage of connected learning opportunities. A great way to learn something is to do it again and again. Scratch users can access the skills demonstrated by more advanced users by examining their code and storing useful elements in their backpack for use in their own project. When they see the creations on the front page, they are challenged to explore the code and see if they can use or adapt it. If they get really stuck, the support resources are clearly linked. Watkins (2016) states problem-solving is what makes Scratch such a great tool because children learn to tinker. Resnick and Robinson (2017) confirm promoting hypothesising, risk-taking and peer-support were their aims when developing Scratch and its community. According to Ito et al. (2013), the participatory community and culture found in a connected learning environment is key to its users being able to support each other. By ‘doing’, the users are building the community. By commenting, the users are supporting the community. By remixing and giving constructive criticism, the users are improving the community. Scratch is strengthened by this participatory culture. Needing to know how to replicate a game or copy a new effect makes Scratch a never-ending challenge. The projects featured on the front page have an important role to play in intriguing less proficient scratchers. Users understand that to improve and achieve mastery, they must meet this challenge. Additionally, collaboration allows users to create superior projects than would have been possible alone. While there aren’t achievement levels, users can see project popularity in the favourites, loves, views, and remixes statistics. Ito et al. (2013) believe users create social and cultural capital as they get respect for their progress. An example of constructive criticism on Scratch. Being able to take constructive criticism is an important life skill. Modern learners are beginning to understand that not knowing something is okay because they appreciate they can go and find out. Brennan (2013) states this allows students to relax more, knowing they will find an answer from peers, research or tinkering. The challenge is what gives the sense of satisfaction and fun when a project is successfully completed. Olsen (2011) says educators need to nurture critical learners who can evaluate the validity or usefulness of information. Scratch users are constantly evaluating the success of other projects. Educators need to support this by challenging students to be critical of information sources (including the ones they provide). Ito et al., 2013, p. 81. Scratch is a successful learning environment due to its cyclical nature. Success, knowledge and learning are paid forward, with yesterday’s learners becoming tomorrow’s mentors. Introduced by peers, coding clubs and classroom projects, new recruits continue to swell the ranks of coders. Scratchers find ways to make their solo work relevant to others through collaboration and learn academically relevant skills along the way. Control of when and what to share remains with content creators, but taking the brave step of sharing projects rewards everyone. Scratch is blossoming, with new projects, comments and users increasing every month. Most Scratch users are aged between eight and eighteen, but there are thousands in their seventies. Countries like the USA, Canada, the UK, France and Australia have a high proportion of users, but Scratch’s reach is global. The statistics are encouraging: Scratch crosses national and generational lines and connects people. Dron and Anderson (2016) say this ‘crowd learning’ has a crucial and positive significance for lifelong learning. We have the many teaching the many. Even though we might not realise it, crowd learning occurs whether the intention to teach was there or not. Stacey and Pearson (2017) observe sharing occurs for many reasons including showing ability, humanity, process or self-improvement. Displaying your vulnerability and imperfection in your quest for lifelong learning doesn’t just help you to grow, it encourages others to do the same. According to Martin (2015), understanding how connected learning improves outcomes for learners in existing projects can help educators plan future ones. I hope tomorrow’s learners will have the opportunity to connect their interests to academic success. Like Jones (2015), I hope we will find ways to include more learners in connected learning, especially those who currently have fewer opportunities. The challenge for educators is to give way, freeing ourselves from the outdated role of the educational ‘gatekeeper’. We need more high-quality connected learning environments like Scratch and we need to teach learners how to discover and navigate connections independently. By using Scratch, students can learn an important lesson: there is a world of experts, inspirational people and new friends out there for us to connect with. We just have to be brave and take our first steps. Association for Computing Machinery. (2017, May 25). L@S 2017 Panel: “Creative Learning @ Scale, ” Karen Brennan, Cristóbal Cobo, and J. Philipp Schmidt. Benkler, Y. (2017). Law, innovation, and collaboration in networked economy and society. Annual Review of Law and Social Science, 13, 1. Dron, J., & Anderson, T. (2014). Teaching crowds. Athabasca University Press. Filipiak, D. (2014). Shared Purpose. In A. Garcia (Ed. ), Teaching in the connected learning classroom (pp. 87 – 102). Garcia, A. (2014). Academically oriented teaching. In A. Garcia (Ed. ), Teaching in the connected learning classroom (pp. 39-54). HarvardEducation. (2014, May 8). Karen Brennan’s ‘8 for 8’. Hunt, B. (2014). Openly Networked. In A. Garcia (Ed. ), Teaching in the connected learning classroom (pp. 71-86). Jenkins, H., Ito, M., & Boyd, D. (2015). Participatory culture in a networked era: A conversation on youth, learning, commerce, and politics. John Wiley & Sons. Jones, C. (2015). Networked learning: An educational paradigm for the age of digital networks. Cham: Springer. Lee, C. (2014). Production-centred classrooms. In A. Garcia (Ed. ), Teaching in the connected learning classroom (pp. 55 – 70). Maggio, L., Saltarelli, A. & Stranack, K. (2016, 16 March). Crowdsourcing the curriculum: A MOOC for personalized, connected learning. EDUCAUSE Review. Martin, C. (2015). Connected learning, libraries, and connecting youth interest. Journal of Research on Young Adults and Libraries. Mirra, N. (2014). Interest-driven learning: Student identities and passions as gateways to connected learning. In A. Garcia (Ed. ), Teaching in the connected learning classroom (pp. 10 – 24). O’Donnell-Allen, C. (2014). Peer-supported learning. In A. Garcia (Ed. ), Teaching in the connected learning classroom (pp. 25 – 38). Olsen, R. (2011). Understanding virtual pedagogies for contemporary teaching and learning: An Ideaslab white paper. Resnick, M., & Robinson, K. (2017). Lifelong kindergarten: Cultivating creativity through projects, passion, peers, and play. Cambridge, Massachusetts: The MIT Press. Shin, S., & Park, P. (2014). A study on the problem solving ability of primary students through mathematics logic solving with Scratch. Information (Japan), 17(10B), 5277-5282. Stacey, P., & Pearson, S. H. (2017). Made with creative commons. Copenhagen: Ctr+Alt+Delete Books. Tierney, W. G., Corwin, Z. B., Fullerton, T., & Ragusa, G. (2014). Postsecondary play: The role of games and social media in higher education. Baltimore, Maryland: Johns Hopkins University Press. Vaca-Cardenas, L., Bertacchini, F., Tavernise, A., Gabriele, L., Valenti, A., Olmedo, E., Pantano, P., and Bilotta, E. (2015). Coding with Scratch: The design of an educational setting for elementary pre-service teachers. Paper presented at the 2015 International Conference on Interactive Collaborative Learning (ICL). All screenshots, mindmaps, photos and icons were created or captured by the author unless otherwise attributed. The terms and conditions for Scratch screenshots and the use of its logo can be found here.